The ever increasing computerization of business processes and mission critical applications, combined with the rising number of Internet technologies, has created new security threats for computer systems and networks. Numerous studies indicate that amongst the various types of security threats, the ones that originate from legitimate user actions can have serious consequences for the health of IT infrastructures. Although incidents of external origin are also dangerous, the insider IT misuse problem is difficult to address for a number of different reasons. This thesis is concerned with the systematic study of the nature of Insider IT misuse problems, as well as the development of experimental insider IT misuse prediction techniques. The systematic study of legitimate user misuse actions is necessary due to the composite and variable nature of Insider IT misuse. The thesis contains the results of a small scale survey that highlighted many important aspects of insider misuse actions. The results formed the basis for a suitable Insider Misuse Threat Prediction Factor Taxonomy, the end product of the systematic examination of the insider IT misuse phenomenon. The taxonomy was then used to construct a systems architecture that facilitates legitimate user threat prediction. Although the proposed experimental architecture is far from the quality of a production-level utility, it constitutes a novel Insider Threat Prediction Model, which at the time of writing is unique in terms of its comprehensive design. It is considered that the predictive techniques could be taken forward in future research, in order to enhance the capability of existing Intrusion Detection Systems and aid IT professionals to mitigate Insider threats effectively. 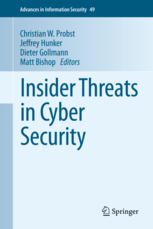 Various aspects of the proposed threat prediction model, the Insider IT misuse survey, as well as the proposed Threat Prediction Taxonomy have been published in conference proceedings and journals. 10 publication(s) - all categories.